In most cases asp.net C# VB.Net developers need to check or validate user input for integer, decimal & DateTime. Asp.net C# provides us an easy way to validate those user inputs from server side. Here in this small article i will show you how one can validate using Asp.Net. Basically TryParse boolean returntype method will help us to check user inputs. It Converts the specified string representation of a Date and time / Integer / Decimal to its DateTime equivalent Integer equivalent Decimal equivalent and returns a value that indicates whether the conversion succeeded or not. 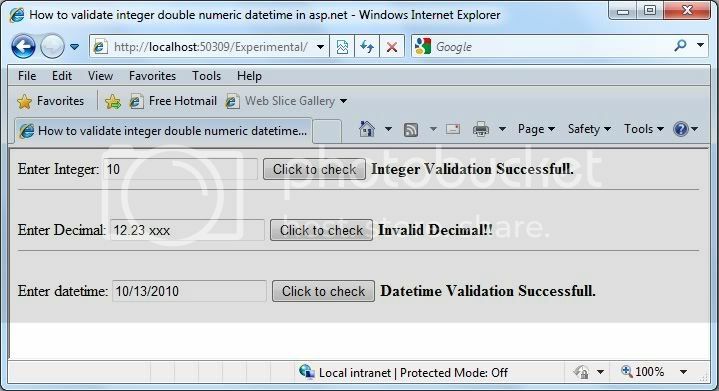 In the below example i will show you to validate DateTime, Integer & Decimal values validation. Check the code how i use TryParse to validate datatypes. Hope now you can validate any primitive datattypes using asp.net.